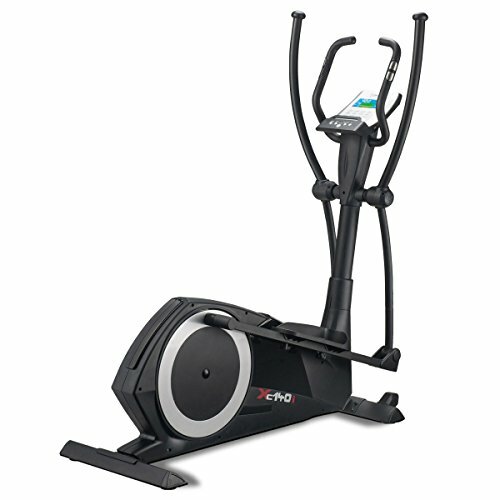 Summary: The DKN XC-140i Cross Trainer is a quiet and stylish full-featured mid-priced model. It has app integration as well as its own multi-functional on-board computer / display. This model has automatic resistance (32 levels) which you is controlled via the console. It has a heavy 14kg flywheel and super-smooth 16 inch stride action. This elliptical has glowing user feedback and a very nice amazon.co.uk discount too. Check the product page for info on these, and a gallery featuring close ups of the computer console. Flywheel:14kg (31lbs). 32-Level Computer Controlled Resistance. Stride Length:16" (40.6cm). The DKN XC-140i is a mid-range elliptical cross trainer with app connectivity, automatic resistance changes and a super smooth action. Compared to many of the budget ellipticals out there, this is an amazing looking machine – though you’ll need a dedicated space for it. The key stats are a 14 kg flywheel (this does make a noticable difference in the general smoothness), max user weight of 120kg (that is almost 19 stone), 32 resistance levels which are computer controlled. If you have used a cheap elliptical where you have to stop and turn a knob to adjust the resistance, you’ll understand that this is a big selling point. The stride length is 16 inches, which should be plenty for the majority of users, if you are over 6 feet tall, you might want to look at machines with longer stride lengths. The biggest unique feature is access to the DNK app. You can plug in your iPad and appear to move through different terrain while you are using the machine. One commenter was glowing about the machine, though gave a 2 star review on the basis of issues with the refresh rate on his new iPad, which felt a little harsh to me! The console itself has a mix of preset programs and a custom one, and will display your progress in a smart 2 colour display unit. There are 4 separate user profiles possible too. You’ll get all the key info from the console, including that all-important calories burned number! Some assembly is required, though there are no comments suggesting that this is difficult. There are two words which appear frequently in different reviews. These are ‘Smooth’ and ‘Quiet’. Compared to the squeeks and clunks you might expect from budget cross-trainers, this is a big advantage. Thoughts on the apps was mixed, though generally positive. No tablet / iPad is included, though as one user has done you can pick up a cheap generic tablet and still enjoy the app functionality. On the negatives side one user had issues with parts going wrong. These were included in the warranty and replaced, though the user is obviously unhappy to have needed to do this. The instructions for using the console were also singled out as useless, though this was the same reviewer who was angry about the app… so there is the possibility there that this is a reviewer who finds the TV remote ‘infuriating’ too! This is a very nice elliptical at a mid-range price. If you know you enjoy these machines, and want a quality product with smooth action, versatile console and unique apps – then this may well be the one or you. You can see the latest amazon.co.uk discount, gallery and read the feedback from current owners over on the product page – check it now. Fitness Review is your go-to site for information on fitness equipment and technology. Don’t forget to bookmark us today! Fitness Review is part of the amazon.co.uk / EU affiliate program. When you click links and buy from amazon, we may receive commission. © 2019 FitnessReview.co.uk. All rights reserved.